Of the Premier League's handful of ever-present teams, Aston Villa have perhaps enjoyed and endured the widest range of fortunes during the last couple of decades in the top flight. Today they're poorly equipped for their own expectations, the past looming large as they struggle to come to terms with the fact that success - real success - requires oligarch-level spending. In amongst the unthinking demands for owner Randy Lerner to sell to somebody, anybody, who's richer than he is, there remains a large section of the Villa support who aren't really sure what they even want anymore. After all, if it takes being Manchester City to finish ahead of Manchester City, it's not really a sport anymore. The Premier League, ratified by the Football Association in 1992 after Bert Millichip supposedly spied an opportunity to undermine the Football League after taking against the tone of its post-Hillsborough blueprint for the game, is a frequent target for football's traditionalists and Villa supporters number heavily within those ranks. It might have been very different had the first season had a different conclusion. Villa kicked off the 1992/93 season knowing that quiet Saturday afternoons would be few and far between. Larger than life manager Ron Atkinson, formerly of West Bromwich Albion and Manchester United, had joined Villa from Sheffield Wednesday and had a season under his belt before the beginning of the inaugural Premier League campaign. Atkinson has latterly been publicly shunned because of despicable words that were at odds with a long history of enlightened actions, but in 1992 he was just Big Ron. Weighed down by gold and shaded from the spotlight by status sunglasses, he was a believer whose confidence and preference for exciting football were infectious as the new league got underway. Atkinson had a formidable side at his disposal. If a reliable spine is an indicator of a great team then it's little surprise that Villa challenged at the top of the table. European Cup-winning goalkeeper Nigel Spink and his flamboyant deputy Mark Bosnich were directly protected by Paul McGrath and Shaun Teale, for many the best defensive pairing since the club won the First Division in 1981. With Steve Staunton and Earl Barrett manning the flanks Villa's defence weren't going to allow easy pickings for anyone. Kevin Richardson was a true leader in the middle of the park and was ably assisted by Ray Houghton, while record signing Dean Saunders and his frequently injured strike partner Dalian Atkinson became known as the Deadly Duo thanks to their goalscoring exploits in the laced-collar strip of the West Midlands' most storied club. Garry Parker and Dwight Yorke were also useful contributors, with a trusty stable of support players available to Atkinson when the need arose. Despite the optimism, Villa struggled early on and were clearly in need of the goals that eventually arrived with Saunders in September 1992. They didn't win until their fifth outing of the season and it wasn't until a memorable 4-2 win against Liverpool that Atkinson's team really got going. Saunders scored twice against his old club on his home debut but the headlines belonged to Ronny Rosenthal, the unfortunate Reds player responsible for one of the sport's all-time great missed sitters that afternoon. Saunders scored six goals in four games and Villa grew. An unbeaten spell of ten games eased them from early September into mid-November and six of those games were won to leave Atkinson the manager's men in third position. The highlight of that spell was a sensational solo goal by Atkinson the player at Selhurst Park, topped off by an umbrella-laden celebration after the former Ipswich Town and Sheffield Wednesday man had weaved his way through the Wimbledon team and chipped the goalkeeper in the rain. 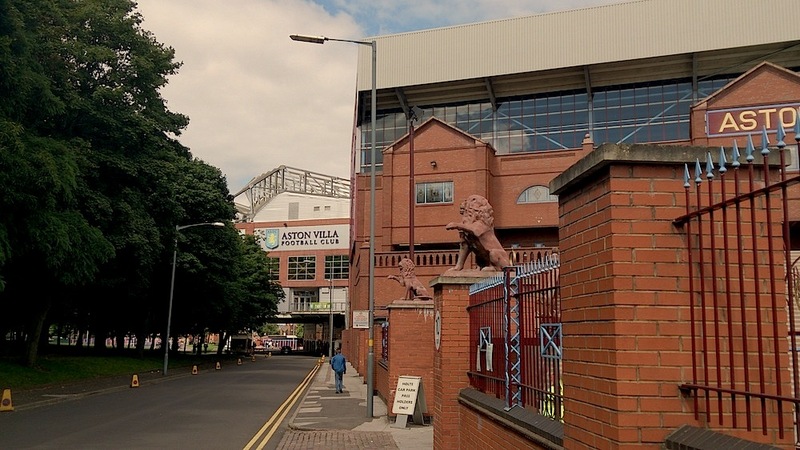 Villa's title challenge was consolidated during the winter by their superb home form. Seven consecutive home victories - a record that hasn't come close to being matched by the club since - became a run of eleven home games unbeaten and provided the foundations for what became a stern test for eventual champions Manchester United. Indeed, Villa briefly went top in January and again in February as they and the Red Devils, under more than a little pressure from Norwich City, duked it out for the top spot. Nottingham Forest, Arsenal, Middlesbrough and Sheffield United were all seen off in December 1992 and January 1993, and Ipswich were the next visitors as February began. Yorke scored the first but his effort was overshadowed by a brilliant looping volley by Saunders, a real high point for the new signing in his exceptional first year at Villa. The unbeaten home run also took in a 2-0 win over Wednesday in a game that peaked early thanks to Yorke's finishing touch at the end of an excellent passing move just minutes into the game. Every outfield player except Teale touched the ball but more telling was the statement of intent from a team that was, by now, back in first place and going all out for the title. The Holte End was at its very finest - loud, rowdy and throbbing - hailing its table-topping players at the top of its lungs. It was a bold but ultimately unrequited display of faith. Villa's run-in began to go wrong with a defeat against Norwich as United's grip on the trophy started to tighten. Three wins and a draw followed the loss at Carrow Road but defeats to Blackburn Rovers, Oldham Athletic and Queens Park Rangers ensured that Atkinson and Villa ended the season staring at a Premier League table whose ten-point gap between United in first and Villa in second did nothing to reflect how close it really was. The nadir of Villa's collapse was the loss at home to Oldham, whose victory that day was achieved courtesy of a single Nick Henry goal and became part of their own Premier League story as they battled to avoid relegation. For Villa, it was the day that reality bit and the challenge died. The mood around Villa Park was as disbelieving as it was distraught, the silence punctuated by knowing glances between shocked supporters: this had been their chance. Villa and Doug Ellis went on to miss more opportunities to push on in the 1990s. The money that flooded into the top level of the game in the years that followed left Villa, a club rendered unambitious and occasionally rudderless by its chairman, trying to swim up a waterfall. For many, Lerner was the last hope. The debate about his leadership continues but is underpinned by the knowledge that the levels of investment required to return the club to the pinnacle of the English game in the modern era would be tantamount to gaming the game. Some want that and others don't, but neither would truly enjoy their own preferred outcome. But Big Ron's Villa in 1992/93; now that was football. Chris Nee is an IBWM content editor and is the host of the Aston Villa Review podcast.